Have a valid personal email ID and mobile number, which should be kept active till the completion of this Recruitment Process. 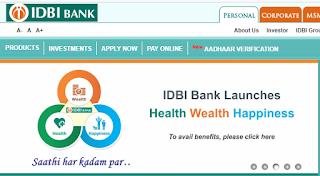 Candidates to go to IDBI Bank’s website www.idbi.com and click on the “CAREERS” to open the link “Recruitment of Executives - 2018” and then click on the option “APPLY ONLINE” which will open a new screen. (ii) To register application, choose the tab “Click here for New Registration” and enter Name, Contact details and Email-id. A Provisional Registration Number and Password will be generated by the system and displayed on the screen. Candidate should note down the Provisional Registration Number and Password. An Email & SMS indicating the Provisional Registration number and Password will also be sent. (iii) In case the candidate is unable to complete the application form in one go, he / she can save the data already entered by choosing “SAVE AND NEXT” tab. prior to submission of the online application candidates are advised to use the “SAVE AND NEXT” facility to verify the details in the online application form and modify the same if required. Visually Impaired candidates should fill the application form carefully and verify/ get the details verified to ensure that the same are correct prior to final submission. (iv) Candidates are advised to carefully fill and verify the details filled in the online application themselves as no change will be possible/ entertained after clicking the FINAL SUBMIT BUTTON. (v) The Name of the candidate or his /her Father/ Husband etc. should be spelt correctly in the application as it appears in the Certificates/ Mark sheets. Any change/alteration found may disqualify the candidature. (vi) Validate your details and Save your application by clicking the “Validate your details” and “Save & Next” button. (vii) Candidates can proceed to upload Photo & Signature as per the specifications given in the Guidelines for Scanning and Upload of Photograph and Signature detailed under point “C”. (ix) Click on the Preview Tab to preview and verify the entire application form before FINAL SUBMIT. (x) Modify details, if required, and click on “FINAL SUBMIT” ONLY after verifying and ensuring that the photograph, signature uploaded and other details filled by you are correct. (xi) Click on “Payment” Tab and proceed for payment. (xii) Choose the Payment Mode ONLINE and click on “Submit” button. NO CHANGE IS PERMITTED IN PAYMENT MODE ONCE CHOSEN. 2. The payment can be made by using Debit Cards (RuPay/Visa/MasterCard/Maestro), Credit Cards, Internet Banking, IMPS, Cash Cards/ Mobile Wallets by providing information as asked on the screen. 5. Non-generation of ‟E-Receipt‟ indicates PAYMENT FAILURE. On failure of payment, Candidates are advised to login again using their Provisional Registration Number and Password and repeat the process of payment. 6. Candidates are required to take a printout of the e-Receipt and online Application Form. Please note that if the same cannot be generated online, transaction may not have been successful. 7. Preserve the hard copy of the system generated online Application form and e-Receipt for submission during the time of document verification & pre-recruitment medical test. The hard copy is not to be sent to the bank. The image file should be JPG or JPEG format. An example file name is : image01.jpg or image01.jpeg Image dimensions can be checked by listing the folder files or moving the mouse over the file image icon. Applicants using MS Windows/MSOffice can easily obtain photo and signature in .jpeg format not exceeding 50KB & 20KB respectively by using MS Paint or MSOffice Picture Manager. Scanned photograph and signature in any format can be saved in .jpg format by using „Save As‟ option in the File menu and size can be reduced below 50KB(photograph) & 20KB(signature) by using crop and then resize option (Please see point (i) & (ii) above for the pixel size) in the „Image‟ menu. Similar options are available in other photo editor also.